Get the Amped Wireless AC1200 Wi-Fi Range Extender to enjoy Internet connectivity in maximum areas of your house or office. It repeats 2.4GHz and 5GHz signals from a Wi-Fi-enabled router to expand them to other areas, while providing maximum bandwidth. Offering ultra-fast AC1200 Wi-Fi speeds, the extender proves suitable for streaming HD videos and enjoying undisrupted gaming. The extender also has a Gigabit wired port, so you can add a device to your Wi-Fi network. Moreover, it features eight amplifiers, which help boost the coverage and remove dead spots. 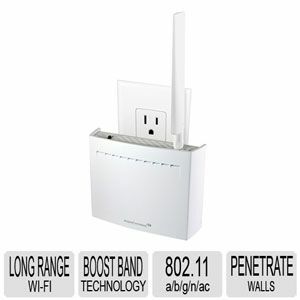 The Amped AC1200 Wi-Fi range extender has a simple plug-in design, which enables quick and easy installation. Using the BoostBand technology, the extender efficiently streamlines Wi-Fi traffic, thereby increasing the overall speed. The LED on the extender indicates the signal strength, so you can identify the best location for installing it. This Amped high-power Wi-Fi range extender is compatible with most brands of single or dual-band Wi-Fi routers and service provider gateways, proving to be ideal for guestrooms or conference rooms as well. It also works with the networking features of Apple devices, making it suitable for use with iPhones, AirPlay speakers, AirPrint printers and more. You can restrict network access and alter schedule settings for the network as per your requirement. It also supports a secure push-button setup for devices with WPS enabled on them. 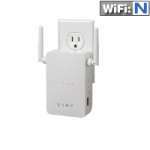 Buy Amped Wireless AC1200 Wi-Fi Range Extender today!